The digital bench scale has become one of the most popular types of weighing equipment on the market. Our offerings go above and beyond to improve performance and provide superb quality. This device is manufactured under strict regulations to ensure quality. This type of scale is widely used in many industries. Digital bench scales give operators space to weigh and pack items. These scales provide operators with the accurate weight of a variety of products. Companies can avoid profit loss due to inaccurate weighing. This problem was very common in the past when analog weighing scales were used. People working in manufacturing facilities need to do their job quickly and accurately, which is easy to accomplish through the use of digital bench scales. 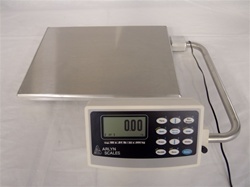 Digital bench scales are commonly used to weigh products that are already packed. They give out quick readings so that operators can maintain quality control. The highly sophisticated models are equipped with specific programs that interface information to the operator then signal whether to release a package for inspection or hold it for replacing, repacking or disposal. These scales are beneficial for weighing food ingredients. Their platforms provide enough space for dispensing the ingredients. Operators may dispense ingredients manually. There are also specific attached devices that are programmable to dispense specific products. Most digital bench scales can store different recipes in their memory. When the accurate recipe is met, the digital bench scale has the ability to signal the feeder or valve machine to start the next step in the process. The digital bench scale is a sensitive instrument. A befitting model should be used for a particular working environment. There have been incidences when the load cells worked inefficiently. This has been the result of impact on the platform. Digital bench scales have not functioned properly when products exceeded the capacity. Digital bench scales are not to be dropped. This can be extremely damaging to the electronics of the scale. The repair of digital bench scales can be costly and difficult. Our products are durable and the professional support staff is always there to help. Aluminum is commonly used to make load cells. If something heavy falls on the platform an aluminum load cell can easily become damaged. This damage may require changing the load cell. Some manufacturers use plated steel as a substitute for aluminum. Fortunately, there is another great solution for this type of problem. Instead of plated steel or aluminum, manufacturers can also use stainless steel. Load cells made with stainless steel are costly and quite difficult to manufacture. Manufacturers find it hard to machine, but it is proven to be more efficient and reliable. Stainless steel load cells provide superb performance. In fact, our digital bench scales have stainless steel load cells and platforms. Also, We have added a silicon cover to the stainless steel sensors so that they remain functional even in wet or damp environments. Stainless steel is a water resistant material. With the additional silicon coating, it becomes more durable and protected from potential damages caused by liquid. Another advantage is that these materials are less likely to be affected by harsh chemicals. Another great feature of our digital bench scales is the display. Bold graphics make these displays very easy to read even from a distance. The digital interface also serves as a good means of communication between the device and the operator. Digital bench scales have many features that can be complicated to understand. Improper use of these devices may lead to equipment damage and inaccurate readings. It is important that operators and owners read the manual and understand it accurately. Most of these types of scales allow users to choose the unit of measurement. Stainless steel load cells are very durable. They combine efficiency and durability but it is important that manufacturers use the material properly. By doing so, they can maximize the life of the equipment. This can also make the weighing process faster than with aluminum and plated steel load cells. Stainless steel is very sturdy and rugged which allows these load cells to operate faster than other types of load cells. Some digital bench scales are great for both wet and dry working areas. These are most often used in industries that require the production of heavy goods. Digital bench scales with stainless steel load cells give precise results all of the time. This is why most of them come with a higher price tag than other digital scales for weighing equipment. Smaller versions of these scales can be found in the produce department of supermarkets. They allow customers to view the price of their products and their weight. The better viewing gives customers the assurance that they only get the amount of goods they need. Schools, laboratories, couriers and postal companies also utilize the same type of equipment. There are even geologists and construction workers who use the same scales. This is mainly because it can stand any unfavorable weather condition. This equipment is also the choice of meat and poultry companies. These machines support a number of applications and are not just for large production companies. Digital bench scales come in different forms. Some versions often have readouts and controls either below the scale or above it. They often have a metal framework that raises it up. Most often, scales with higher read outs are more convenient. This allows for easy reading of the results, even with big merchandise on the scale. Furthermore, highly advanced digital bench scales have the ability to send messages and signals through Ethernet, RS-232 and RS-485 connections. Consumers always have options when it comes to these communication technologies. These can be great for large companies with high production demands. This allows large companies to finish the production process as scheduled. With this, they can meet deadlines and keep up with clientsÕ orders. It will also use less manpower than before. The integration of these digital scales with other equipment can often outperform personnel who do it manually. This means bigger profits. The equipment’s capacity to store information also allows faster processing. Newer versions of digital bench scales have larger LCD screens with inch high graphics. This is very beneficial for operators. With these scales, they will never miss a single digit when reading the results. Using stainless steel load cells along with sophisticated communication technology creates digital bench scales of superb quality. Many companies regard this equipment as the best digital scale. They offer incomparable functions to support various applications. They can also save space and be placed just about anywhere. Because there are so many types of digital bench scales, customers can get confused about which one they should purchase. To narrow the choices down, they should start by considering their weighing needs. Simple weighing applications may not necessarily require a pricey scale. By the same token, they should not compromise their profit by settling for cheaper, low-quality digital bench scales. Customers should also take note of the seller. They should only trust those that are certified to sell these products. Weighing equipment should adhere to the standards of the industry and purchasing one should be taken seriously. We offer many digital bench scales for customers, with each unit guaranteed to be durable and efficient.